Do you hate writing your blog? Maybe it’s because you run out of ideas when you see that blank screen. Or maybe you feel challenged with grammar, spelling and putting the pieces together for an article. Maybe you resent the time spent coming up with the ideas, researching and planning the post even before you get to the writing part. Whatever the reasons, you’re not alone. Most online business owners report dreading the two “B’s”: Blogging and Bookkeeping! There seems to be no end to the excuses not to do that writing. Unfortunately, with the procrastination and resulting inconsistency in getting content posted on your blog, traffic suffers. I’ve got good news for you. Let’s say you hate to write or feel you’re just not good at it, or you’ve run out of ideas to stimulate the creative juices. There are other ways to consistently create shareable content without your fingers pecking too much on a keyboard. Guest blogging is a fantastic way to both generate content and get in front of a whole new audience. Other bloggers, marketers, coaches, and service providers are looking for ways to grow their audiences, and many of them would jump at the chance to appear as a guest on your blog. It’s a win/win for both of you and your readers when you choose your guest bloggers carefully. What if you’re not into guest blogging? Have you heard about a text interview or a cross-blog conversation? Simply supply a list of questions to your interviewee, and post her responses. The interview format is perfect for introducing your audience to someone they might want to get to know better. A cross-blog conversation requires a little more work on your part (and fingers on the keyboard) but it can be a fun way for your readers to get to know you a bit better. A cross-blog conversation is exactly what it sounds like: a discussion that takes place on two different blogs, with you and your blogging partner both offering opinions about a topic, just as if you were having a chat over coffee. Podcasting and video blogs are more popular than ever and they’re perfect for those who don’t care for writing. With this type of content, all that’s required is you, sharing your thoughts. You don’t have to do anything as involved or complex as interviews, and you certainly don’t have to hire a studio for a day to record a series of “professional” videos. You can create podcasts and video blogs with nothing more than your laptop with its built-in camera or a headset and an audio recorder. Just fire up your computer and share your thoughts. Don’t worry about perfection, your visitors will love a chance to see and hear the real you! Chances are, you share a variety of content on your social media accounts. Articles you’ve read, videos you’ve enjoyed, infographics that explain a complex idea in a simple way. It’s part of what makes social media fun and informational. But what if you took your sharing one step further, and posted your thoughts on your blog first, before linking on social media? The result of this curation technique, where you add your opinion with a link to the original article or video, is that you drive traffic to your site rather than someone else’s. Not only that, but it gives you more opportunity to start a conversation with your readers about the content you’re sharing. It can be very frustrating to rely on Google or the other search engines to send traffic your way. A better method is to encourage sharing on social media. Creating content can seem an overwhelming task when you’re not a wordsmith. 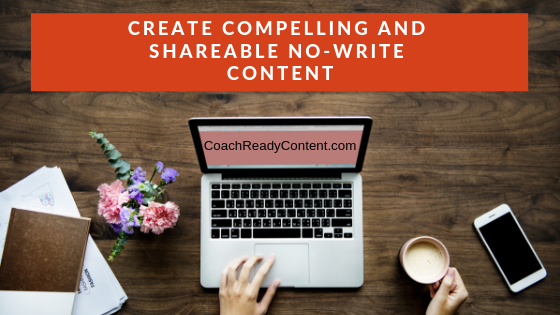 Rather than giving up and allowing your blog to feel neglected, think outside the box for some other ways to create content your readers will enjoy and share. Wonderful ideas! I’ll be sure to add these to my strategies. Thank you so much Edith!